Captured here in over 200 vintage images is a photographic documentation of a section of America that was all but uninhabitable until the late 1800s. Before that time, the area was the home of a few scattered Native American bands and traditional eastern Washington desert wildlife: sagebrush, rattlesnakes, and coyotes. Only through the efforts of the railroad and the entrepreneurs, explorers, trappers, settlers, and homesteaders was this area, located along the banks of the mighty Columbia River as well as the Snake and Yakima rivers, transformed into a bountiful oasis in the desert. Kennewick is on the direct route of the Oregon Trail, as well as the Lewis and Clark trail. 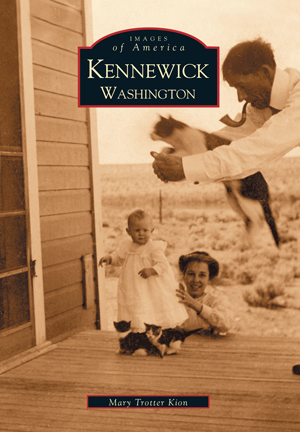 The story of Kennewick begins in 1883-with the arrival of the railroad and an era when steamboats and the men who plied them were pivotal in the town's settlement. These vintage images tell the story of Kennewick's early businesses, frontier homes, schools, churches, and community experiences. Mary Trotter Kion has lived in the Tri-Cities area for the past 23 years. She is a writer and contributing editor to the online publication, Suite 101, which features articles on regional and Western history. She maintains and writes articles for her own website on women in the West.